Do blondes really have more fun? Find out the answer to this age-old question when you enhance your 'do with this Blonde Ponytail Clip! You are sure to love the long, smooth, silky tresses of this platinum blonde, bombshell hairpiece. 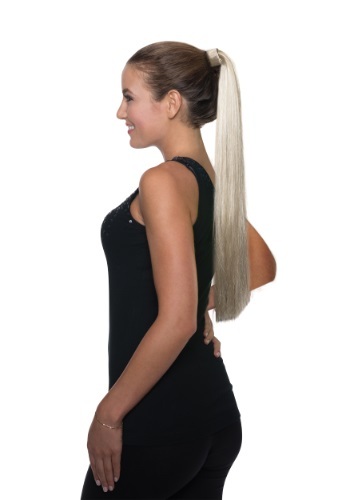 The Blonde Ponytail Clip is 24 inches in length, so we promise we won’t blame you if you feel the sudden urge to whip your hair around, once you put this on. It attaches easily to any ponytail, for a secure, confident look that will last all night long so have fun dancing the night away! The Ponytail Clip will add a hint of glamour to any rock star, movie star, or pinup girl costume or look. Your friends might even go gaga for it and there is no doubt about how you are going to be as radiant and bright as a star, lucky! Plus, we think it's pretty fabulous that you can have really long hair without having to take vitamins to grow it out like Rapunzel.Work it, girl!